Reporting that an “incident” occurred is as informative as saying “something happened.” An incident could be anything from a fatal heart attack, a hit and run, a flash mob, a crime or a terror attack – virtually anything at all. 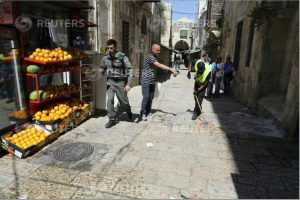 Surely by the time that the photos were filed – in the last image, a worker was already cleaning up in the aftermath of the attack – it was at least known that a stabbing attack took place. Yet, that caption, and others, were missing the absolute bare minimum of information. 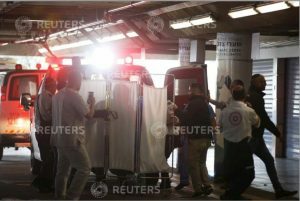 Why, is it though, that time and again, other news agencies have managed to confirm that a Palestinian attack took place, or at least that the Israeli authorities said that an attack took place, while Reuters can only confirm that an “incident” occurred? 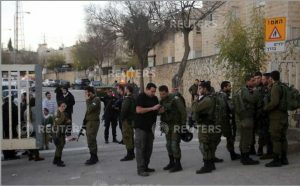 Israeli soldiers stand at the entrance of the Givat Havot settlement, between the occupied West Bank city of Hebron and the Kiryat Arba settlement on its outskirts, on January 11, 2019, after an attempted stabbing attack by a Palestinian. 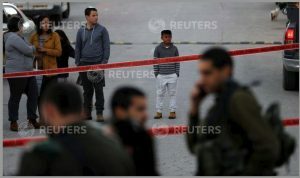 An Isreali [sic] soldier is consoled as Israeli forces and forensic experts inspect the site of a Palestinian drive-by shooting attack outside the West Bank settlement of Givat Asaf, northeast of Ramallah, on December 13, 2018. 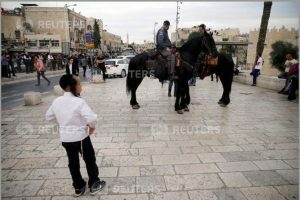 Two Israelis were killed and at least two others were wounded at the bus stop in the occupied West Bank, the army said. 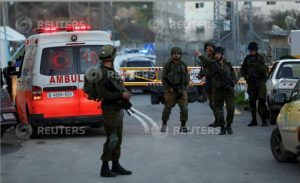 “A Palestinian opened fire at a bus stop killing 2 Israelis, severely injuring 1 & injuring others at Asaf Junction, north of Jerusalem,” the Israeli military said on its Twitter account. Thus, either Reuters repeatedly has been slow to get information compared to other leading wire services when it comes to Palestinian attacks against Israel, or it has deliberately whitewashed these attacks as unspecified “incidents.” Neither option reflects well on the news agency.